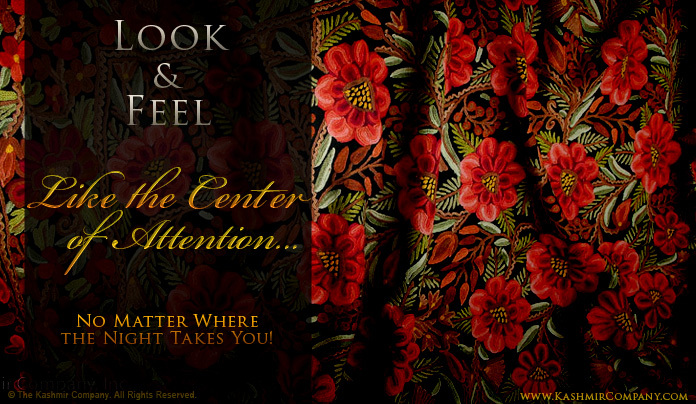 Look & Feel Like the Center of Attention… No Matter Where the Night Takes You! There’s no more magical of a feeling than when you’re dressing up for a special night out on the town. You’re absolutely filled with desire… and can literally FEEL your imagination light up with anticipation for the memorable experiences that are forthcoming. On this wondrous night, make him remember why he’s with you by accentuating your natural beauty with one of our Evening Shawls – and stylishly separate yourself from the rest of the crowed. We have Authentic Handmade Kashmir Evening Shawls that are sure to satisfy every taste for style, texture and elite fashion. In fact, no evening is glamorously complete without an authentic Kashmir Shawl to make your elegant evening wear come to life! Browse our handmade selection below and choose the shawl that calls your name! And as always, contact us with any of your important questions!